CONICET professionals talk about their studies in this field. 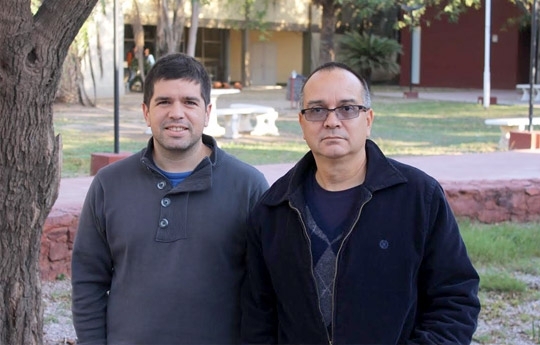 Raúl Paz, CONICET independent researcher, focuses his studies, along with Ramiro Rodríguez Sperat, assistant researcher of the Council, on family farming and its different logics and perspectives. Both scientists work at the Institute of Studies for Development (INDES, Instituto de Estudios para el Desarrollo) of the Faculty of Humanities, Social and Health Studies of the National University of Santiago del Estero. RP: For many years we have been working on subjects related to family farming including its potential, the farmer efficiency, identification of family farmers who grew by joining the markets, its territorial development, the study of the short circuits used by family farmers, quantification and concentration areas of family farming, communal systems and agrarian social movements. RR: First, we are trying to understand these production systems that use a different logic than the one taught at universities. Through several applied research projects, we are also coordinating with different institutions and organizations such as the Secretariat of Family Farming of the province of Santiago del Estero and the National Institute of Agricultural Technology (INTA, Instituto Nacional de Tecnología Agropecuaria). To discover its potential and interpret its production strategies and social reproduction allows us to think about alternative production designs and public policies to boost the area. Which are the main problems that family farming faces? RP: It faces many problems, even more than the average considering the strong social and environmental burden implicit in it. In spite of the fact that nowadays the governments agree on the importance of the sector and its major role to mitigate food, ecological and social crises, and the need to strengthen family farming to ensure global food sovereignty, it has not always been like this. For a long time farming was pictured as a modern farming sector of large-scale production where the intensive use of supplies ad the high mechanization were the salient features. For the same reason, small family production almost disappeared and was seen an intermediate stage of agricultural development. RR: There is dissociation between the way in which the population normally obtains the food and the way in which family farming markets its products. Currently, the supermarket is the great centre of supply of society, but these chains have deepened asymmetries and the dependence of small farmers due to strong pressure they exert on they to adapt, pricing and impersonal rules of hygiene, quality, standardization and certification, thus separating even more the urban and the agrarian world. Most consumers do not know the origin of the food they consume, its composition and its health consequences. Furthermore, customers are subject to the prices imposed by supermarkets because is their only option. RP: Family farming markets its products primarily through short and decentralized circuits that, in part, are beyond the direct control of the capital. This system links farmers with consumers, fosters humane treatment, shows the origins of the product, and it generates lower environmental impact because the food is not transported over long distances or packaged. Besides, to reduce the number of intermediaries, allows consumers to purchase food at more affordable prices. Which are the characteristics of family farming in Argentina? RP: In general, it is very diverse. This sector includes different players with different logics of production. Each region has a specific dynamics and dissimilar agro ecological conditions associated with the distribution and differential concentration of small producers in the Argentine countryside. RR: Historically this production model was based on the use of family labour in the process of production, on accumulation strategies, ownership of the land and different forms of access, rental property and the formation of small stockholders, transfer through inheritance, relations with the formal markets and a level of mechanization in farming tasks. Nowadays these issues promote debate within the family farming. RP: In contrast, the northwest region is strong on different forms of peasant production and farms without defined boundaries. The composition of agricultural players in the northwest is very different and,, consequently, the academic concern is focused on the persistence of peasant logic, the distancing from the market, assessment of local resources, agrarian social movements and the construction of defensive behaviours or peasant resistance, where the administration of some productive activities, especially livestock, are their main basis. What is the current situation of the sector? RR: For many years the official systems oriented towards data logging, such as national agricultural census, have not focused on a survey to improve identification and understanding of family farming, thereby contributing to their invisibility because its figures and its production potential are not presented, and its possibilities to have an active role in the construction of an endogenous and sustainable development remain hidden. RP: There have been many attempts and efforts from the National Registry of Family Farming (Registro Nacional de la Agricultura Familiar) to quantify this sector. Their numbers note about 220.000 undertakings on family farming. Nevertheless, the processes of loss or creation of these farms are very dynamic. While in some areas there are some depeasantization developments, in other places there are peasantisation processes because people are returning to the countryside, looking for a better quality of life or a way to survive the pressure of the cities. The truth is that there is no accurate information to develop this idea. Can family farming coexist with market agriculture? RR: This has been one of the most significant questions for the main schools of thought that study the agricultural issues in the context of economic policy. Their key speakers discussed the disappearance or persistence of small production before the advance of capitalism in agriculture. RP: In principle, we can say yes: both agricultures can coexist. Since we live in an essentially capitalist system, family agriculture cannot ignore the market just as the formal market has to recognise the benefits of family farming for the society. It is necessary to be done, but is also important to have a strong regulation because due to the nature of market agriculture, it tends to absorb family farming in a certain period of time.